This year is the 10th anniversary year for Cardiff Street Pastors. Everyone is welcome to join us at our 10th Anniversary Celebration Service on Thursday 14 June, 7.30pm at City Church, Cowbridge Road, Cardiff. 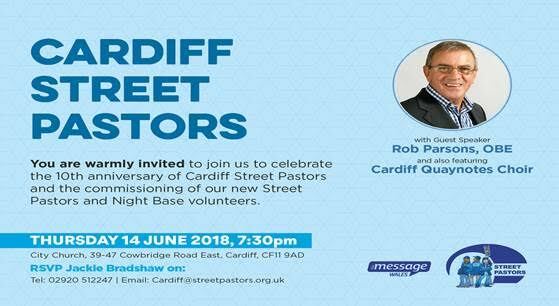 We will be commissioning our new street pastor and night base volunteers, as well as the night featuring guest speaker Rob Parsons and Cardiff Quaynotes Choir. If you would like any more information about the event or want to RSVP please get in touch with Jackie: cardiff@streetpastors.org.uk / 02920 512 247.